The portable ‘StreetWok LP20’ from CINDERS BARBECUES Ltd, introduces new technology to an ancient method of cooking, solving the problems of noise and skill levels inherent in traditional wok burners. Asian flavours are bursting out of oriental kitchens and into vibrant Street Market catering, where convenience is critical to success. They predict the compact power of their new product will also enable popular stir-fry cooking to find its way into beer gardens next to the ubiquitous barbecue and onto hotel patios as the themed component of a memorable occasion. The StreetWok LP20 packs 16kW of controllable punch into a portable appliance weighing only 17kg. This kind of power is usually accompanied by a loud roar, whilst CINDERS uses a ‘flower head’ array of patented low pressure burners to diffuse the sound and spread the heat around the base of the wok. Spreading the heat also avoids the difficult wok ‘hot spot’ and allows heat to penetrate food faster and more evenly, enabling more reliable throughput without specialist training. Made in Britain and CE safety compliant, the StreetWok LP20 represents a real technical breakthrough and is set to offer fresh opportunities to all sectors of outdoor catering. Streetzine will be rigorously testing and reviewing the StreetWok LP20 over the coming months, look out for our full feature arriving in your inbox soon. 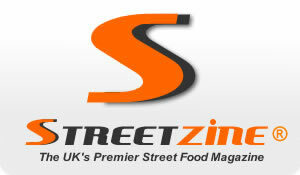 Not subscribed to Streetzine yet? Just pop your details in the box at the top right of this post to receive free regular updated and news.